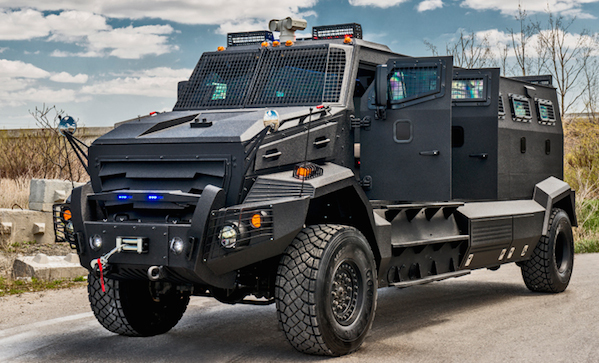 Doubtful that our Canadian audience will ever need an APC, but we have to admit, this is one cool APC. The INKAS Huron has a 8.3-litre Paccar engine and a ten speed Allison transmission. It’s armour, which covers both the passenger compartment and engine bay, is designed to withstand anything up to 7.62×51 SC ammunition, 7.62×51 M80 NATO ball ammunition, and is tested to meet NIJ-STD-0108.01 level III / CEN level B6 ballistic standards. Worried more about explosions? Well, the floor is fitted with blast protection to defend against fragmentation from 2 DM-51 German ordinance hand grenades or equivalent. Again, we’ll never need one. But it’s nice to know the option exists in case the Cola Wars ever devastate Canada again.